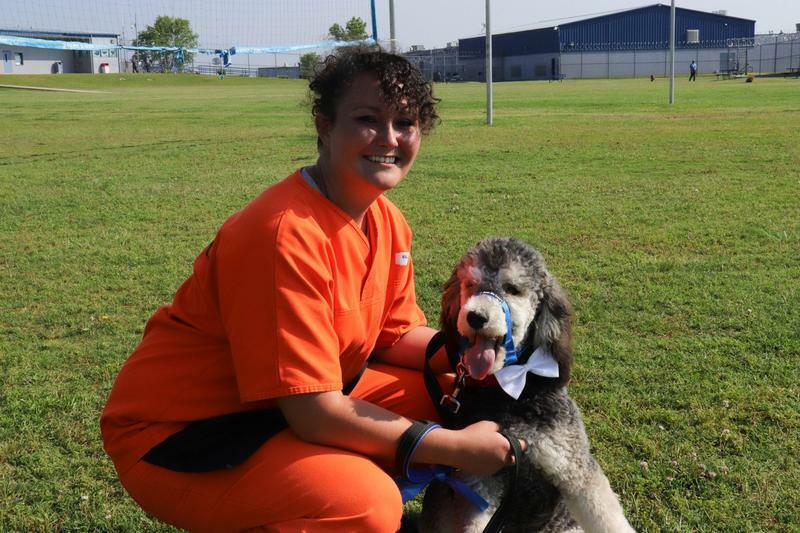 McAlester is the seventh dog Lacey Wallace has trained for the Guardian Angels program at Mabel Bassett Correctional Center. StateImpact's Quinton Chandler reports on the dog-training program at Mabel Bassett Correctional Center. The prison program teaches women responsibility and life skills by training undisciplined, unwanted dogs for adoption. The dogs learn basic commands and manners potential owners want in a well-behaved pet. Some of the dogs are also trained as service animals. Lisa Bennett, the program’s coordinator, says the women learn skills they can use for jobs outside of prison. She says many of the women see themselves as the “throwaway(s)” of society and find kinship with animals that no one wanted. Construction of the training facility started in 2014, but labor and funding setbacks delayed its completion until earlier this month. The Department of Corrections finished the project with help from Oklahoma CareerTech.